I mean they say curiosity is a good thing, right? Well sometimes some people take their curiosity a little too far. I was taking a bus this morning (just because my car was being serviced) when I was set upon by one of those busy body strangers who have 10,000 questions to ask. Yes, I chose to sit next to her but I didn't engage her in conversation. I thought she looked a better option than the teenage school boy with a large skateboard or the nun (I didn't really want to hear about the Pope's visit for the millionth time this week). However, three seconds into the journey 'she' started asking me all sorts of questions. "So, what did you have for breakfast?" she asks. No, it wasn't the usual banter about what a cold day it is, or the bus is crowded today. No, she may as well have asked me what my bra size was or how much I earned (which I am sure were on the tip of her tongue and coming some time before the final stop). Thank God I got out when I did. For some unknown reason, I felt this 'perfect stranger' had no right to ask me what I ate for breakfast. Maybe I am just overly sensitive early in the morning. And no, I didn't have garlic the night before, and no, I wasn't wearing my breakfast all over me either (I did check just in case). I was gobsmacked. Was she employed by some market research agency to survey passengers? I just told her that I didn't eat breakfast. She smiled and then went on to the next question. It's funny how some people's curiosity knows no bounds. I think I have a sign on my forehead that says 'this women loves any kind of whacko so please approach'. Plus, have you noticed these types just do not read body language at all? She took no notice of the look of shock and horror that was etched on my face or the fact I was literally turning in my seat with my back to her. Oh no, my indifference just egged her on. Where do you work, are you married, how many children do you have, where did you get your coat? By the end of my trip I felt I had been put through the ringer and had come out the other side the worse for wear. I felt like a stiff drink for morning tea. So I am changing tact. I obviously need to practice being more direct and nosy myself. So tell me, What did you eat for breakfast?I had toast and Vegemite, eggs and a strong coffee this morning. Speaking of eggs I saw this very cute video recently that made me smile. Watch and you will see why. That was really a cute story and I loved the video snippet. There really is such a thing as Vegemite? Oh my gosh! See how dumb I am. I thought that was just something from a famous old "I Love Lucy" show! Vikki - yes, Vegemite is a little hard to describe but it exists! Oh and I loved the Lucy Show too! I had an encounter the other day similar to yours. My stepmother and I had to stop at a tire repair shop to remove a nail in my tire and patch it. It was lunch time so we figured we could walk next door and eat a bite and when we returned the car would be ready. Well when we returned an hour later they had just begun to work on the tire. So we took a seat in the waiting lounge. I sat in a seat next to a man who was intently watching the news. I noticed when I sat down he turned and looked (kinda stared) at me. I felt his gaze a tad bit long so I looked him in the eye and nodded hello. He made some arbitrary comment about the news story. It struck me as strange that he assumed I shared his views (it was a political piece). I kind of nodded again and glanced at DJ (stepmom) with a eye rolling expression and started to email on my blackberry. Minutes later he started telling jokes. Not funny ones. Lame ones. It was like he was practicing a comic routine. I tried to do the ol, "don't encourage em" laugh and overly exaggerate my concentration on my blackberry. It was to no avail. Luckily after his 8th or 9th one liner about whatever was on the news, they called him for his car. He even was talking as he exited the room. I can't tell you how bizarre it was. Now, I love a good joke or a friendly person but this was just plain weird! He finally got the laugh he was trying to get from us but it wasn't at his joke! I had half a cinnamon raisin bagel and oj for breakfast yesterday. It is 1:20 in the morning right now, so no breakfast yet!! Jules - you are up late or early... That guy sounded like he was trying to impress you...funny how some people have no self awareness, and just are plain weird. Glad I am not the only one it seems to happen too. Bagels are big over there heh? We have them but they are not as popular - a raisin one sounds pretty yummy though.Funny I have never been able to drink OJ since I was pregnant with my daughter - morning sickness turned me off a few things (including an Estee Lauder moisturiser) and I have never been able to stomach them again. Which is a shame as I used to love OJ. Told you I was strange!!! I get up in the middle of the night often. I just wake up and can't go back to sleep for a few hours. I like it because my internet connection works much faster. Yep, bagels are a big hit here. I am not a huge fan but Bobby is. I try to drink a peach or strawberry yogurt for breakfast. I am keeping up with my 2 mile walking about 3 to 4 days per week. I lost 6lbs! I feel proud! 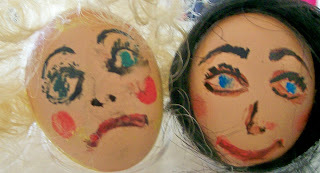 I noticed that after the eggs became 'human' I found the broken one frying in the pan...almost Ubearable! The second one was almost worse. Your interrogator sounds awful. I remember sitting on a train, opposite a 'Mr Bean' character, and thinking that my reply of "I'm an accountant" would save me from the tedium of explaining about life in the theatre, when he replied "Oh that's very interesting. I'm an accountant - are you Chartered?"